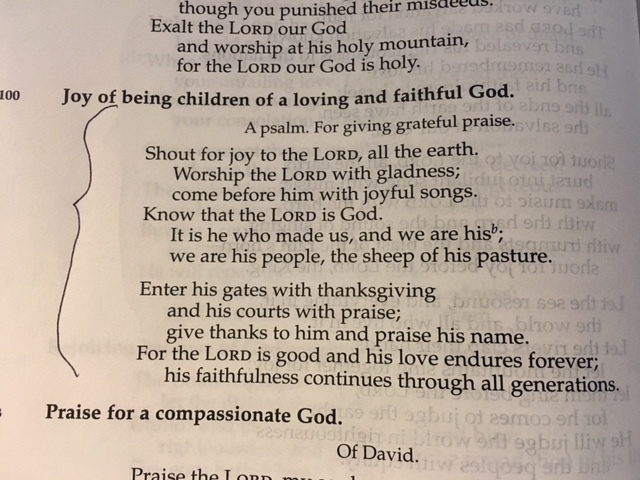 All of the earth shouts because you bring us so much joy, LORD! We worship you with smiles on our faces! We sing praises to you because of the joy you give us! We know you are God. You made us. We are yours. We are your people. We belong to you. We are so grateful that we have the privilege of having a personal relationship with you, God! When we come together in your house, we are filled with praise! You are so good to us! Your love will never end. We praise you for your faithfulness to us and to our parents and our grandparents and everyone that has lived before us. And we praise you for your faithfulness to our children and our grandchildren and all of those who are yet to come. We know we can always count on your faithfulness, dear God.